I had a hankering for a croissant and decided to drive over to Nielsen’s Bakery, a local bakery I don’t go to often, but they made nice croissants. All I found was a letter on the window saying they had closed after 21 years. The letter read like a note to a few insider friends and I could not really understand what it said, except that they were closing. The letter confirmed to me why I had not patronized them for years. I always felt I was an outsider there, a tolerated visitor interrupting a local Kaffeeklatsch (an informal gathering) at the local clubhouse. Nielson’s was in downtown Homewood, Illinois, next to the commuter train stop. A Starbucks with a drive-through now operates on the other side of the parking lot. The Starbucks does $20,000 a week in business and there are two other Starbucks in the area that do a similar amount of business. My guess is that Nielsen’s was lucky to do $5000 a week. Nielsen’s was a daytime operation while Starbucks is open 5:30 a.m. to 10 p.m.
Another local bakery, Sweet Annie’s, opened three years ago, and in my opinion that was the final blow that killed Nielsen’s. Not only were Annie’s baked goods superior, the ambience of the shop was warm and welcoming. Another element most likely came into play in the demise of this small business. Homewood, like the rest of the south Chicago suburbs where I live, is becoming a predominantly African American community. Nielsen’s was clearly an old school Homewood institution, patronized mainly by Caucasians—and proud of it. If I felt like an outsider when I walked in, I’m sure a black person would have felt uncomfortable there. The restaurants and stores in my neighborhood need to feel like they are connected to their customers. Most businesses, even those that do business online or on the phone, need to have a welcoming feel. Airlines with call centers in India lose tons of business because the people who finally answer the phone have no personal touch, are unable to connect with the customer, and are often hard to understand. Cold callers who read from a script rarely get more than a sentence out before I hang upon them. A machining company owner that thinks he or she is just selling parts with no need for a personal connection with their customers does not understand how business works. Nielsen’s Bakery didn’t fail because of the recession, though it didn’t help. They failed for many reasons, but the primary one was that they just wanted their little neighborhood bakery to stay the same while the world around them was changing by the day. There was an interesting juxtaposition of auction sales recently. Corporate Assets sold Die-Matic in Hamilton, Ontario. Gorgeous machinery including a 2004 L-20 Citizen and a 2003 M-20 Citizen. With buyers premium the L-20 brought $115,000 and the M-20 brought $127,000. Two weeks later TCL Auctions, also in Ontario, sold a 2004 Star ECAS 20 for $175,000 and a 2006 Star SR-20II, for $180,000. A 2007 Willeman CNC Swiss fetched $275,000. In late January, J.L. Spear sold off Alessandro Co., an old Acme shop in Los Angeles. Acme-Gridley 1 1/4” RA6 machines in fair condition of 1970 vintage brought $2-3,000. A little 2007 Okuma ECLII lathe, sold for $23,500. I can add that though the prices on Acmes were dirt cheap at Alessandro, the auction was hastily put together and not extensively advertised. My screw machine dealership, Graff-Pinkert, is seeing a renewed interest in National Acmes, but buyers are looking for tight machines at 2009 prices, of which there are virtually none left in dealer inventories. Just a couple of years ago the skeptics saw General Motors as a hopeless joke run by bumbling fools. Today, General motors is a public company that’s making money, almost debt free, with the Volt adding another shift to production. Equally remarkable, the incredibly complex job of sorting out the $275 billion in claims—750,000 contracts and 70,000 claims, has been 85 percent completed. One of the remaining vestiges of the old GM, known as Motors Liquidations Company in the legal documents, is the Willow Run Transmission Plant in Ypsilanti, Michigan. This gigantic albatross, five million square feet in one building, is on a land site that used to be a Henry Ford-owned farm. It was built in 1942 to make the B24 Liberator bomber. At one point they produced 650 bombers a month. The assembly plant was passed to Kaiser Motors and then to General Motors, where they made the Chevy truck, the Nova and the Caprice. They also made parts for the doomed subcompact, the Vega, and the illustrious Corvair during the 1960s. During the Vietnam War the plant made M-16 rifles and a 20 mm auto-cannon. In recent years, the immense facility was devoted to making General Motors transmissions. Maynards and Hilco Auctioneers have been selling off the machinery over the past year as production tapered off. In six months Willow Run will be a gigantic barn. Already one of the GM plants near Detroit is being converted to a movie studio. Another factory will be used to assemble hybrid vehicles for Fisker Automotive of Irvine, Cal. Willow Run is interesting because of its sheer size, about 5 million square feet. I can imagine putting a dozen soccer fields laid out end to end, or the world’s largest mushroom farm in it. How about America’s biggest indoor zoo? Caltech has had 32 Nobel Prize winners on its faculty, but in sports they are just a bunch of losers. The college basketball team had lost every conference game for 26 straight years; 310 games of futility against local colleges in southern California like Whittier and Cal Lutheran. In baseball they have lost 412 conference games in a row. Why do kids even go out for teams that never win? This is the The Bad News Bears to the 10th power. Caltech finally won a Conference game on January 29th against Occidental (Barack Obama’s alma mater). Should we applaud their fortitude and perseverance, or castigate them for stinking up their league with such pathetic teams? I do have some sympathy for the Caltechers, being a lifelong Chicago Cubs fan. The Cubs were last in the World Series in 1945 and have not won the Championship since 1908, the days of Tinkers to Evers to Chance. To fail is human. To fail and fail and fail and keep on trying is heroic—or is it just mad? Perhaps college conferences and even pro sports should adopt the incentive system employed in European soccer in which teams that consistently fail to be competitive are dropped to lower quality leagues and replaced by aspiring minor league teams. If the New Jersey Nets or LA Clippers were to finish last three years in a row maybe they could be replaced by a D-League team like the Idaho Stampede or Bakersfield Jam. In baseball it could be an incentive for a team like Pittsburgh or Kansas City to stop living off the luxury tax money from the Yankees and Red Sox and actually develop a team. As for the Caltech Beavers, hooray for winning a basketball game. If I were them, I’d stick to Intramurals. Just wanted to alert you that I am available, if the hours are right, to join the stable of writers of your new “Bloomberg View” enterprise. Our views on free trade (pro), taxes (don’t like ‘em) and tobacco (tax it like hell) are congruent. The $500 grand a year you are offering to prominent journalists is a nice round number I could live with. I could add knowledge about the manufacturing world, which your provincial New York Wall Street-focused crowd could certainly use. With your net worth pushing $20 billion, according to Forbes, and your age (late 60s) we have at least one thing in common. I was hoping you would run for President in 2012, but it is looking more like you are leaving the Iowa Primary to Romney and Pawlenty and other assorted losers. Apparently you have looked at the Ross Perot approach and figured it was a waste of time for 2012. Mike, I think I understand where you are coming from. Better to be King than President. Considered it myself. I’ll FedEx my resumé. Keep reading my blog. You are one of the few billionaires who know what Swarf is. 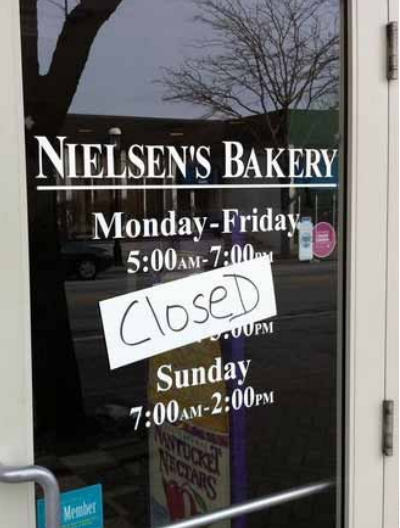 I too, felt like an outsider at Nielsen’s Bakery, but I did hear of its demise and what constituted the nail in their coffin: Their main oven suffered a final breakdown, and replacing it would have cost over $30,000. They simply did have it; that, coupled with the high rent/taxes in downtown Homewood, did them in. I won’t really miss it, but it’s sad to see any business leave our area.